Content marketing is any marketing format that involves creating and sharing media and publishing content in order to acquire or retain customers. Content marketing is not a new concept. Brands have recognized the value of providing customers with useful content for centuries. Content marketing has its roots in the 19th century. In 1895, John Deere launched a magazine called The Furrow, which provided farmers with information on how to increase yields and profits. The magazine is still in circulation and boasts a readership of 1.5 million in 40 countries and 12 different languages. In 1900, Michelin launched the iconic Michelin Guide, offering drivers information on car maintenance, hotels, restaurants and other travel tips. 35,000 copies were distributed for free in the first edition. Although Michelin eventually began selling these books, the publication set a precedent for both informative guides and content marketing distribution. In 1904, the US brand Jell-O distributed free copies of a recipe book to customers in their homes. The campaign contributed over $1 million in sales within just two years. In the 1930s, many consumer brands provided information and entertainment in order to communicate messages about their products and services to customers. Large brands such as Procter & Gamble and Lever Brothers (now Unilever) began sponsoring and producing radio shows in an attempt to connect with listeners at home. A P&G laundry detergent known Oxydol was the sponsor of the Ma Perkins radio show, widely considered to be the first soap opera. In the decades that followed, P&G created 20 soap operas for radio and television, becoming a pioneer in producing award-winning daytime serials like As The World Turns and Guiding Light – which still holds the Guinness World Record for the longest running show in broadcast history. Forward wind to the modern age: the Internet’s democratization of information has resulted in consumers increasingly rejecting direct and invasive advertising techniques. So a number of businesses are investing in producing website and social media channel content in order to increase customer engagement and, ultimately, sell more goods and services. In MarketingSherpa’s 2012 SEO Benchmark Report, content creation is identified as one of the most effective SEO tactics for marketers. According to Econsultancy, marketers spend on average more than 25% of their budget on content marketing. By the end of 2011, nearly 2.26 billion people, that’s one third of the world’s population, were using the Internet. By 2016 this figure is expected to rise to 40 percent, or 3 billion people, largely as a result of the widespread use of mobile internet. 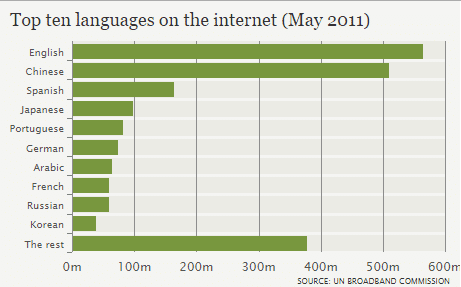 While English is currently the most popular language on the internet, it is predicted that Chinese will overtake English by 2015. Similarly increased internet use in the Middle East, Russia and Brazil is likely be accompanied by an increased use of Arabic, Russian and Portuguese. With brands increasingly crossing international borders via the internet, marketers need to fine-tune their strategies to ensure their brands are taking advantage of global demand. This means that brands will increasingly require localized websites in order to target overseas customers. Content marketing is widely seen as a solution to the problem of declining traditional marketing effectiveness. However, content marketing approaches that work in one territory cannot be guaranteed success in another. Below are some tips on developing a successful international content marketing strategy. It is extremely important to define the objectives of your content marketing strategy before you commit any time or resources to producing content. Content can be very time consuming and expensive to create. By defining the purpose and setting clear aims and objectives, you can ensure that you’re able to identify the right media or channels, as well as develop a message that is suitable for your target audience and more likely to be well received within your target territory. Some organizations may already experience traffic and online sales from overseas territories on their domestic websites. In some cases, there may already be significant demand from certain regions. Data on the location of overseas customers, the products and services purchased, the search engines and devices used, as well as the key phrases, social media channels and other websites visited by your target customers is invaluable when expanding your business abroad. Constructing a compelling value proposition is at the very heart of marketing and should form the bedrock of an organization’s international marketing campaign. A 2007 research study by Siebel showed that over 75% of executives at companies whose new products failed to achieve their objectives blamed poor value propositions as the root cause. A successful brand will typically achieve brand identity recognition through a clear communication of the value proposition and the credibility of the organization. However, identifying the value proposition requires in-depth market research and competitor analysis. Transcreation, or creative translation, is the adaptation of creative work into another language or culture. It is therefore more than the direct translation or localization of a text, as transcreators focus on capturing the desired persuasive or emotive effect of the original work. By considering local traditions and vernaculars, transcreators aim to alter the source text for foreign audiences who may not be familiar with the culturally or linguistically sensitive content of the original. Transcreation is predominantly used for translating marketing and promotional material. Although a business may have had a successful advertising campaign in one country, their message, brand, and product needs to be fully localized to ensure that the content is both suitable and appealing. It is important to understand the cultural nuances of your target market to ensure that you avoid potential pitfalls and translation blunders that might have a negative effect on your brand abroad. Users in different territories display different online behavior and use different channels and platforms. For example, in the West, Google is the dominant search engine with over 60% of the market share in the US and over 90% in Western Europe. However, in China, Baidu is the dominant search engine, with over 70% of China’s internet users preferring their platform while Google has less than 5% market share. In Russia, Yandex claims over 60% of the market share, whereas Google has just over 25%. In Japan, Yahoo! is the market leader with 51% of the market share in 2012, compared with Google’s 36%. Yahoo is also dominant in Taiwan, where it has 65% of the market compared with Google’s 34%. Google’s market share in South Korea was a mere 3% in 2012 while Naver, the local search engine, enjoyed a market penetration of 73%. Finally, although Google has recently secured the top spot in the Czech Republic, Seznam, the country’s first and local search engine still enjoys a market share of over 40%. Similarly, dominant social media channels differ from region to region. For instance, in Japan, Twitter is more widely used than Facebook, whereas in Russia, Vkontakte is the largest social network. Simiarly, Qzone is the most popular social network in China, with a massive 530m users. The way individuals engage with social media depends on a number of factors including age, gender, income and even race. It’s important to analyze the subtle differences in the ways users interact with different social media channels in your chosen region, as this will allow you to develop a more coherent social media strategy that is more likely to engage your target customers. TranslateMedia offers multilingual content marketing services to brands and agencies already present in international markets, or those looking to take the first steps towards going global. Contact us to discuss how we can help.